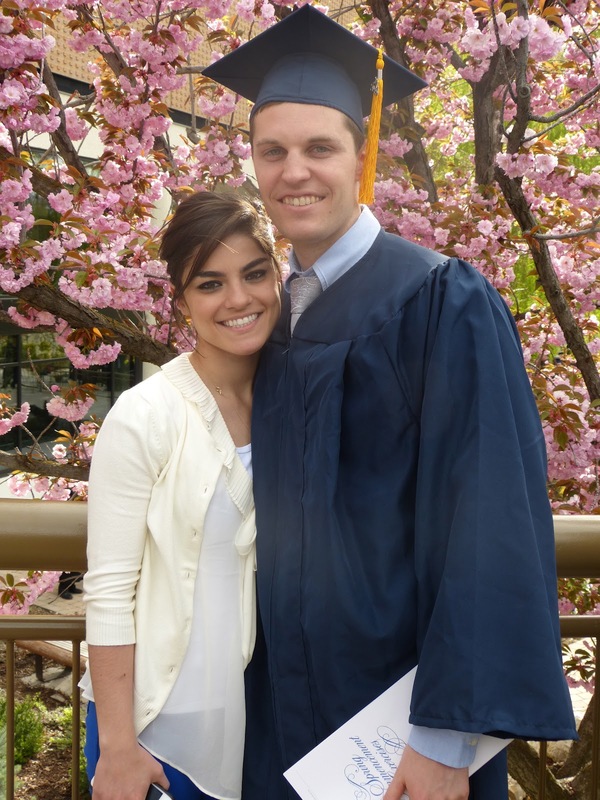 One of the best classes I took at BYU was Marriage Prep from Professor Dorius (if you're still there, take his class. Seriously.) It was with my single older brother and my pre-mish little brother and newly-wed (as in one-week-post-wedding-date newly-wed) me. Our professor found it thoroughly entertaining that the three of us were in this class together at such different points in our lives and it is one of my favorite college memories, mostly because of the ridiculous comments out of the mouths of those two boys, but anyway. Back to my point. Brother Dorius taught us a lesson during that class that I will never forget, and it had a lot less to do with marriage and a lot more to do with education. and serve your fellow men. Wait what?? Your purpose isn't to get me a job when I graduate?? I don't know if I like that! But as I listened to the rest of his lesson it all started to make sense. This was something I had struggled with SO MUCH my freshman year of college. What was my major going to be?? I went in thinking it would be international business, but I just couldn't reconcile that with the fact that I knew I really just wanted to/ was "supposed to" be a mom some day. I couldn't handle the thought of all that education going to "waste" once I quit working and started a family. Sure wish I had known about this lesson then. "You belong to a church that teaches the importance of education. You have a mandate from the Lord to educate your minds and your hearts and your hands. . . . There can be no doubt, none whatever, that education pays. Do not short-circuit your lives. If you do so, you will pay for it over and over and over again." "Because of our sacred regard for each human intellect, we consider the obtaining of an education to be a religious responsibility. . . . Our Creator expects His children everywhere to educate themselves." That means everyone. Not just men so they can support their families, not just women who are currently single and need to support themselves, not just those who are good at school or who want a job, EVERYONE needs an education. Not only will you be prepared to get a job and make money if that's what you need to do, but you'll be better prepared to participate in society, to give back to your community, to educate your children, and to influence those around you for good. "..seek ye diligently and teach one another words of wisdom, yea seek you out of the best books words of wisdom; seek learning, even by study and also by faith." I'm so glad we are part of a church that values education so much! So without further ado, Congratulations to my two favorite new college grads, Zander and Heather! My brilliant brother couldn't figure out how to put on his cap or gown. He got out of the car and had zipped himself in to the gown backwards and had the hat on backwards too. Seriously??? Beca couldn't stop laughing. Don't worry. I don't think my pants are stylish mint green and trendy. I came from work, I'm in scrubs. Heath's graduation was a week after, and I had to work so I couldn't go but I am SO PROUD of my beautiful cousin and so thrilled we all got to be in college together. Never would have made it without her :) and congrats on your job!! so thrilled. 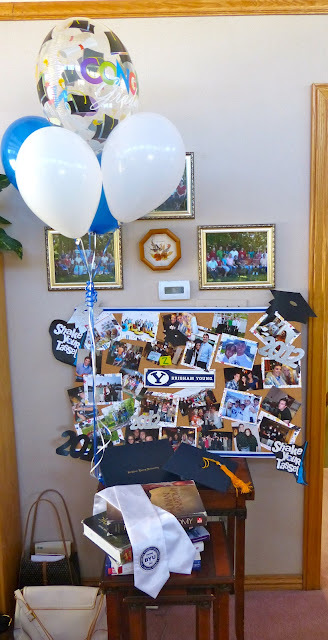 cute Beca's display for Z full of pictures of his 4 years in college. So many memories!! My other favorite graduate/roommate/best friend/ cousin. Grandmother Jane's fresh strawberry pie. My gift to Zander for every celebration, its his favorite. Exercise Science, Nursing, Elementary Education, Public Health, Nutrition: WE DID IT!!!!!!! Still... just love them. So excited for the wedding!! How do you know Katie Brower? She's totally my cousin! Small world, small world.